Musical collaboration between poet Allison Grayhurst, whom we’ve published several times in Synch Chaos, and musician Diane Barbarash. Available for a listen here. 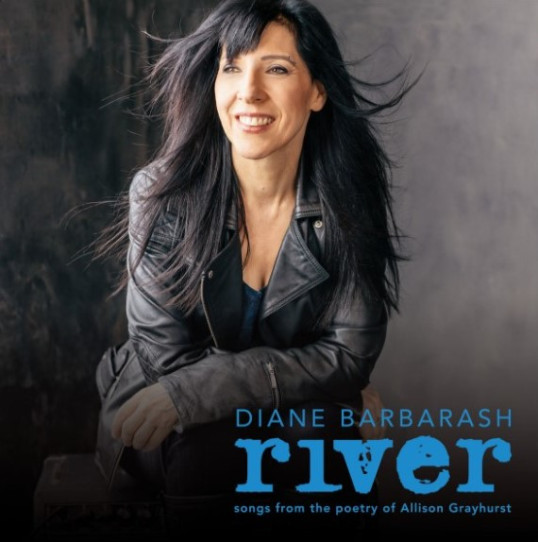 The collaboration for the album River began on New Year’s Eve 2016, when I was immersed in a compilation of poems by award winning writer Allison Grayhurst, Trial and Witness – Selected Poems by Allison Grayhurst. Here, I should mention that Allison and I had been extremely close friends years ago in Toronto, which is my old hometown. When I moved 3000 miles west to Vancouver, we lost touch but reconnected late in 2016 and joyously it was like we’d never skipped a beat. By then she had published several books and I had recorded 3 albums. The reunion with Allison gave me back a piece of myself, that part was immediately evident. And so it followed that I was emerged in Allison’s poetry on that auspicious New Year’s Eve. I don’t even know what possessed me, but I remember impulsively picking up my guitar, scanning the poem I had just read and allowing a verse to flow like magic from a few of the lines. It came out really easily, and musically it sounded like “something”. So I went to another poem and had a similar experience. The following day I contacted Allison and proposed writing an album based on her writing, and she basically said go for it. I told her I would change anything she wasn’t comfortable with, because I would be altering the main structure of her poems and possibly adding lyrics at times as the song needed. Our working relationship as it turns out was very respectful and I was able to write freely with full support from Allison. As we exchanged ideas long distance the test of creative trust and integrity was passed, and as the year progressed we proved well in sync artistically and thus, fell deeply in love with this project. When this album began I had actually just come out of a three-year creative block. Songs, like other forms of art, cannot be forced by the mind. They have to come from the heart and you have to give yourself over to them as they flow out. This is how I’ve always known I am in the presence of true love, the unexplainable lyrical and musical combination that gives birth to what becomes a song. Composing with Allison’s poetry became this kind of pure-heart experience. I am changed and definitely hope that there is more to come. Diane Barbarash was writing songs long before learning how to play guitar at thirteen. She was an active singer-songwriter in Toronto’s folk club circuit before moving to Vancouver where she perused her love of recording. She has released three albums prior to River, however she considers River her true debut. River – songs from the poetry of Allison Grayhurst was released on October 5, 2017. It was composed during January-July 2017, recorded in 4 days in August and then mixed and mastered that same month. River is available now on iTunes, Amazon, Bandcamp, and CD Baby.